See <CHANGELOG.md> for the list of new features and bug fixes in this release. Adding the "iterative auto layout" of labels. Labels auto layout is a sequence of steps, such as skipping some labels, tilting labels, or decreasing label font, that result in label 'fit' nicely, readably, without overflowing or running into each other. 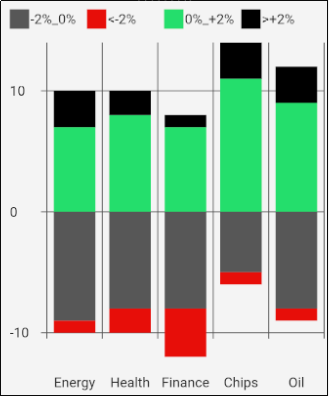 This section illustrates how the auto layout behaves when less and less horizontal space is available to display the chart. 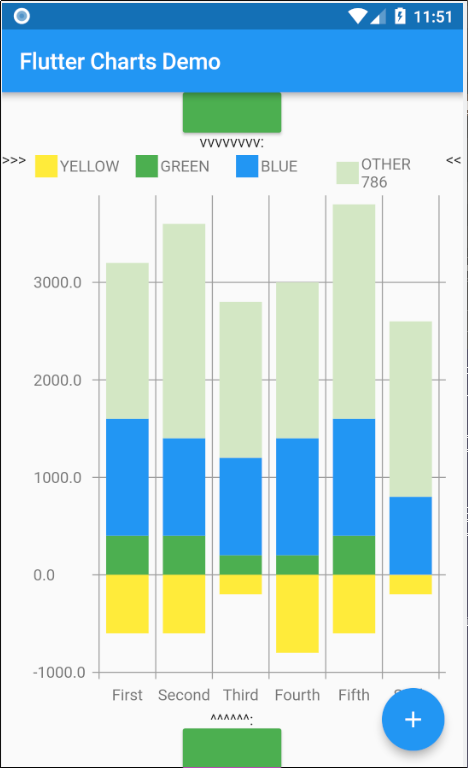 Flutter chart library automatically checks for the X label overlap, and follows with rule-based iterative re-layout, to prevent labels running into each other. 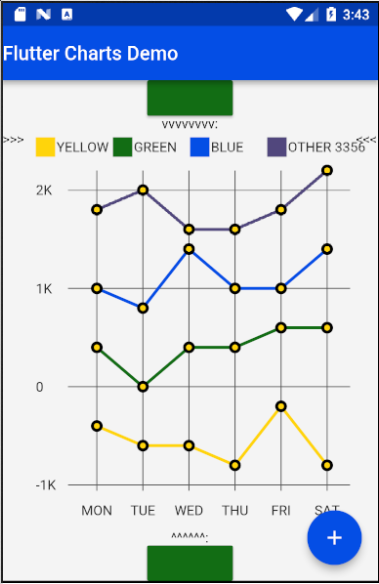 To illustrate "stressed" horizontal space for the chart, we are gradually adding a text widget containing and increasing number of '<' signs on the right of the chart. We can see all x axis labels displayed it full, horizontally oriented. We can see the labels were automatically tilted by angle ChartOptions labelTiltRadians for the labels to fit. Next, let us make even less available space by taking away some space on the right with a wider text label like this '<<<<<<<<<<<'. We can see that labels are not only tilted, but also automatically skipped (every 2nd) for labels not to overlap. Next, let us make even less available space some more compared to step 3, with even a wider text label like this '<<<<<<<<<<<<<<<<<<<<<<<<<<<<<<'. Here we can see the "default auto layout" finally gave up, and overlaps labels. Also, the legend is now hidded, as there is not enough horizontal space. Flutter Charts is a charting library for Flutter, written in Flutter. 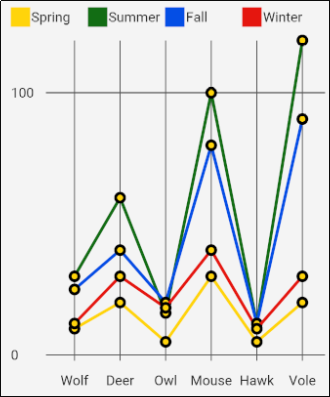 Currently, column chart and line chart are supported. The package is published on pub for inclusion in your application's pubspec.yaml: The Installing tab on https://pub.dartlang.org/packages/flutter_charts contains instructions on how to include the flutter_charts package in your application. There is an example application in flutter_charts: example/lib/main.dart. 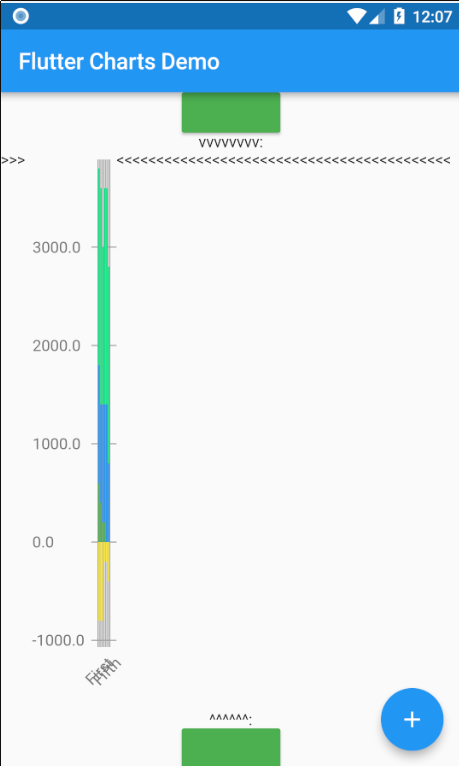 It shows how a Flutter Chart can be included in a Flutter application. You can run the example application using one of the methods (6, 7) in the paragraph below. 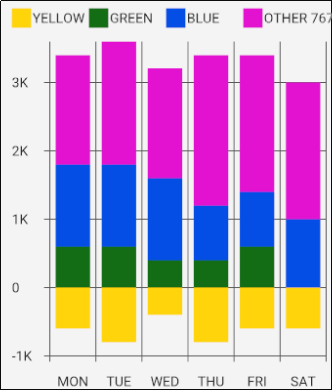 This application is also used as a base to show several sample charts in the paragraphs below. Here we show just two simple sample outputs, a column chart and a line chart. The output is generated from semi-random data. You can click the blue + button to rerun the chart with a different set of rows. Before we show several examples of charts, a few notes. 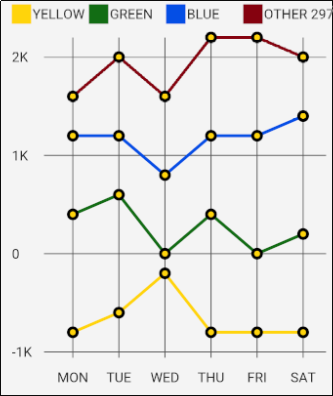 X labels: ChartData.xLabels allow to define X labels. Setting xLabels is required, but client can set them to empty strings. Y labels (optional): Normally, Y labels are generated from data. 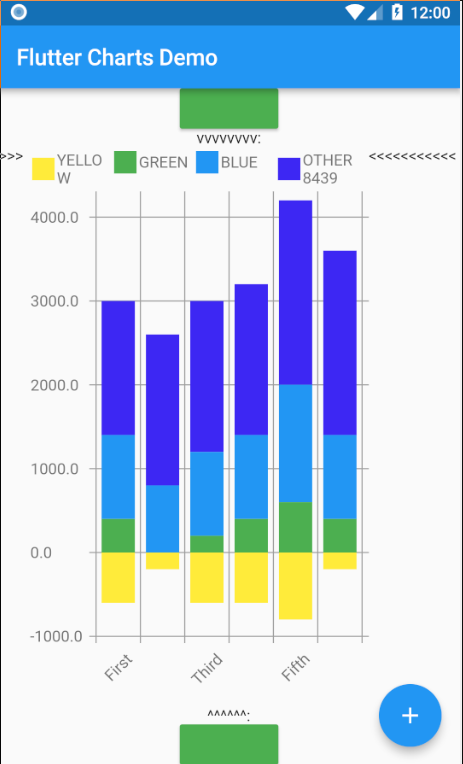 The option ChartOptions.useUserProvidedYLabels (default true), asks flutter_charts to data-generate Y labels. If this option is set to false, then ChartData.yLabels must be set. Any number of such user-provided Y labels is allowed. The ChartOptions class: allows to define options, by using it's defaults, or setting some options to non default values. There are also LineChartOptions and VerticalBarChartOptions classes. Currently the only purpose of RandomChartData is for use in the examples below. To be clear, RandomChartData Y values, series colors, and series legends are not completely random - they hardcode some demoable label, legends, color values, and data ranges (data random within the range). The examples below show a few alternative code snippets (User-Provided or Random data, labels, option) and the resulting charts. 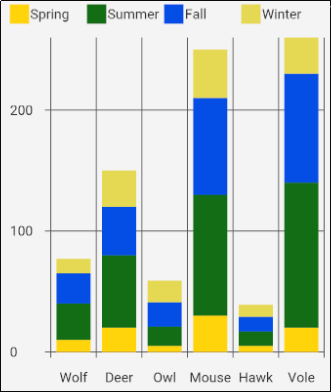 The chart images were obtained by substituting the code snippet to the file:example/lib/main.dart code. Random Data (Y values), Random X Labels, Random Colors, Random Data Rows Legends, Data-Generated Y Labels. This example shows that Data-Generated Y labels is the default. 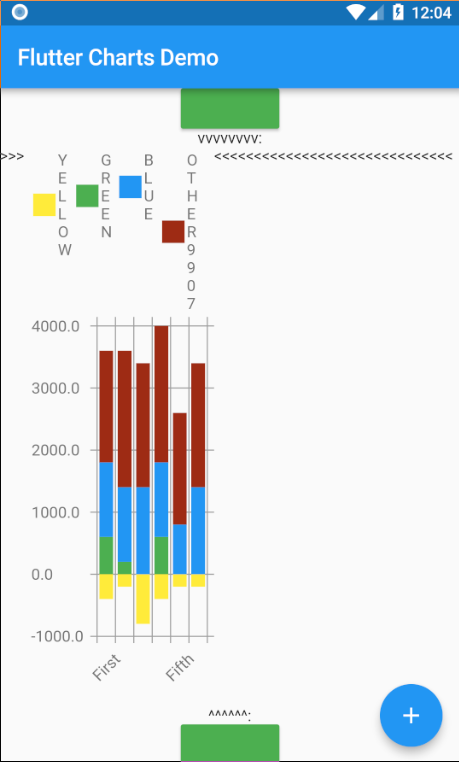 Flutter Charts support reasonably intelligently generated Y Labels from data, including dealing with negatives. 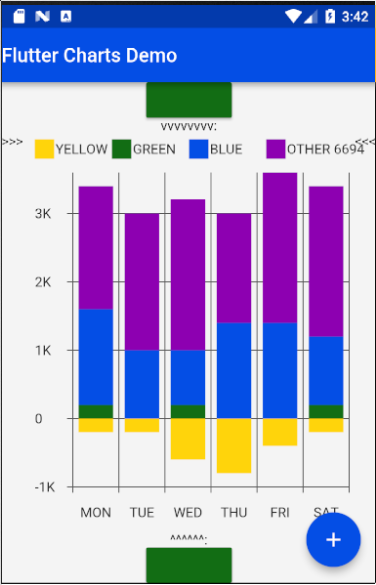 This example show how to use the option useUserProvidedYLabels, and scaling of data to the Y labels range. // This example shows user defined Y Labels. //   <0, 10>, or any other, even negative ranges. Here we use <0-10>. //   The only thing that matters is  the relative values in the data Rows. // on the level of the last Y Label ("High" in this example). // This is not desirable, we need to add a userProvidedYLabelsBoundaryMin/Max. 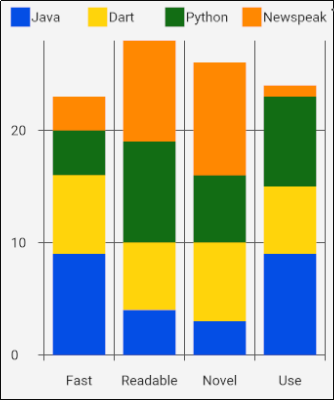 Result vertical bar chart: Here the Y values should be numeric (if any) as manual labeling "Ok", "Higher", High" does not make sense for stacked type charts. 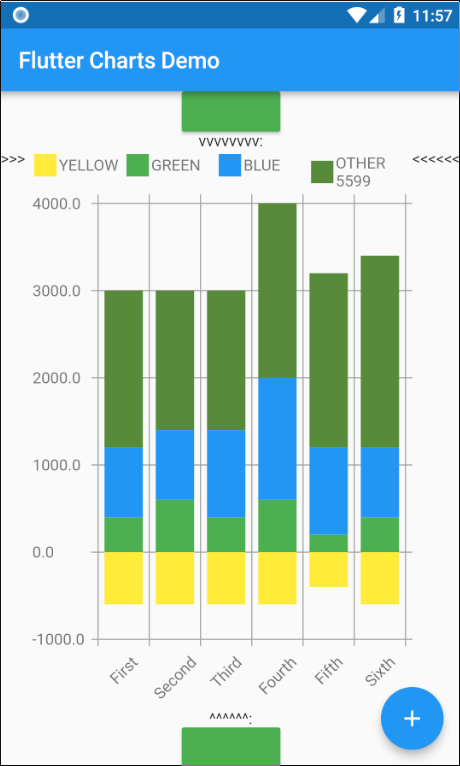 This example has again user defined Y Labels, with a bar chart, using the smart auto-layout of user defined Y Labels. 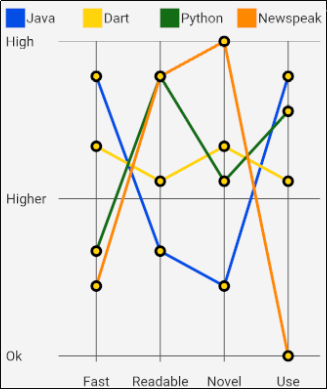 The chart shows negative and positive values similar to %down/%up stock charts. // similar to %down/%up stock charts.